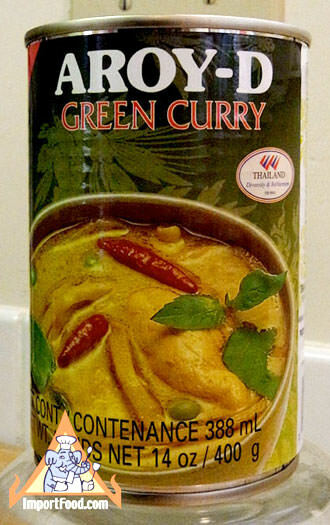 Very delicous, authentic Thai green curry made in Thailand by Aroy-D, known for premium quality all natural coconut milk, which is used by many restaurants around the world. The green curry has very nice generous slices of bamboo shoots and sweet basil leaves. Simply pour into a saucepan, and heat to serve. We added 1/3 cup sliced chicken and let it simmer for 10 minutes before serving with jasmine rice. You can also garnish with fresh Thai basil for a nice touch. Brand new product just manufactured and received directly from Thailand. Ingredients: coconut milk, bamboo shoots, soybean oil, fresh green chiles, salt, garlic, shallot, sugar, wild ginger, lemongrass, basil leaves, kaffir lime leaves, spice (coriander seeds, cumin, cardamom, turmeric), galangal, pepper. All natural. No artificial colors. No preservatives. Product of Thailand.